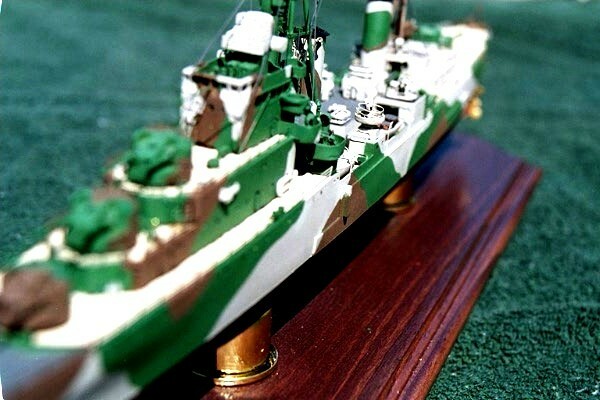 This article is about the build of the recently released model of HMS Sirius, Dido class AA cruiser in 1:350 scale from Iron Shipwright (IS)/ Commander’s Models. 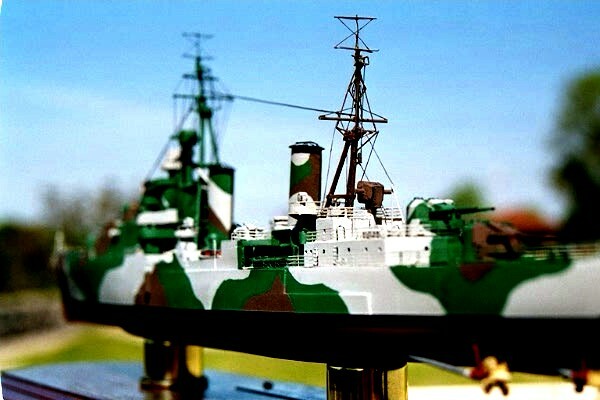 The kit is for HMS Sirius 1942, however, I chose to build it as the sister ship HMS Naiad as she appeared in 1940. An absolutely essential reference in the build of this kit was Ensign 2: Dido Class cruisers by Alan Raven and H. Trevor Lenton published in 1973 by Bivouac Books. This title has long been out of print but is still available from a number of sources. Other references used were British Cruisers of World War Two by Raven and Roberts. This title is somewhat rare and rather expensive, when you can find it. White Ensign has one listed for 130 pounds (around US$208), again as of 5 May. Still in publication, inexpensive and readily available is Profile Morskie #12: HMS Scylla. This title is in Polish but even if you do not speak one word of Polish, it is well worth purchasing just for the plans. Each title in the Profile Morskie series and its big brother, the Monograph Morskie series is highly recommended. Get them while you can. In 1935 the Admiralty decided to rearm and chose two types of cruisers to build, the large Town Class (HMS Sheffield) that was competitive with US and Japanese designs and a significantly smaller ship that could be rapidly built in large numbers to fill the critical numerical shortfall in cruisers. Dido Class was the result of the second requirement. Dido, Euryalus, Naiad, Phoebe were in the 1936 program, Bonaventure and Hermione in the 1937 program, Charybdis, Cleopatra and Scylla in the 1938 program and Argonaut in the 1939 program. The 1939 program also had Bellona, Black Prince, Diadem, Royalist and Spartan, which became the modified Dido Class. The modified Dido’s had significant differences from the original class in the forward superstructure and had straight stacks rather the raked stacks of the originals. Additionally, Charybdis and Scylla were built very differently from the original design in that they had eight 4.5” guns rather than ten 5.25 inch guns and a much larger forward deck house to accommodate a flagship staff. The kit is beautifully cast and is very clean. It requires only a minimum of cleanup. In common with other IS releases there was a narrow resin overcast sprue along the bottom of the hull. This is easily removed and the bottom sanded smooth. There were a few air bubbles on the bottom of the hull. They can be filled and sanded or left as is since they do not show on the finished model, unless you like to model your ships bottom up. IS instructions are still rather sparse but there is a template for the tripods and yardarms. The location of the parts is rather straightforward. I always use other references in building any resin model. If you do not care to purchase an expensive out of print title, the Profile Morskie on Scylla would be more than satisfactory to assist you in the assembly. Apparently there will be further titles in the Profile Morskie Series on the Dido Class. The title on Scylla was subtitled, The British Cruisers of the Dido Class (Part 1). Why Naiad? 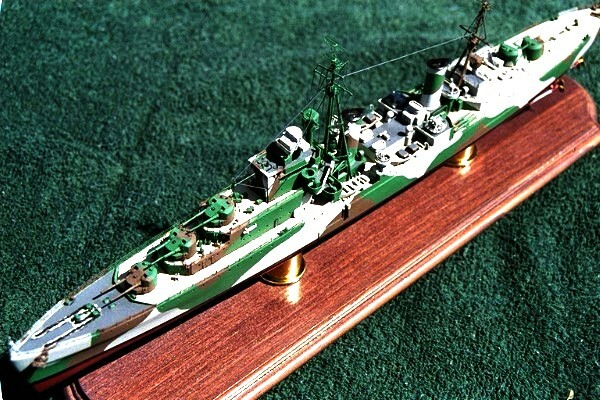 There were a number of reasons that I chose to model HMS Naiad. The first reason should be obvious from the photographs of the finished model. In 1940 HMS Naiad sported a very unusual camouflage scheme. Green, Brown and 507C light gray. This camo scheme seems to have more in common with woodland pattern BDUs than one designed for a warship. If you like this unusual scheme, a sister ship, HMS Phobe, carried a scheme that was all green and brown, except for false bow waves in white. (See color center section in Ensign 2). The colors used were Model Shipways RN paints that match the Snyder and Short paint chips. 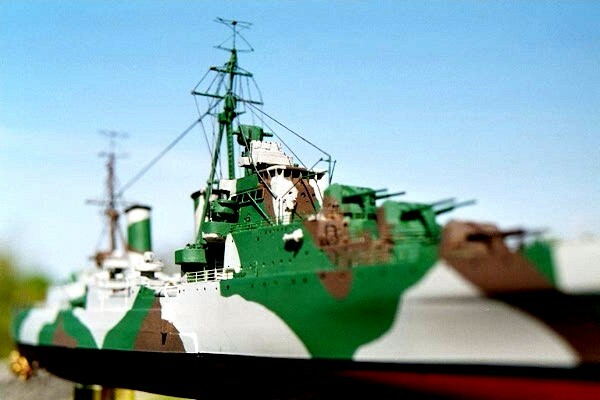 The 507C was a Pollyscale paint that I used for the first coat and provided a good base for the Model Shipways paint. When I thinned the Model Shipways with alcohol, I had no difficulty in spraying it but when I test sprayed it on bare resin, it rubbed off. When I sprayed it over a Pollyscale base, it did not have this problem. Since Model Shipways (www.modelexpoinc.com) has such a wide range of paints, all based on Snyder and Short paint chips, I am determined to find the right mixture or formula to thin this paint for spraying. It works fine with a brush but I have experienced problems using it with a spray gun. The second reason was my desire to build a ship that had all five 5.25” turrets. Due to the fact that the Dido’s were completing at the same time as the KGV Battleships, not all Dido’s initially received all five turrets. The battleships used the same turret for their secondary armament and they naturally had priority over the cruisers. Dido and Phoebe completed without Q turret (#3) and Bonaventure without X turret (#4). In their place, they carried single 4” starshell guns. As mentioned earlier, Scylla and Charybdis had a completely different armament, due to the complete unavailability of the 5.25” turrets upon their completions. Naiad, Sirius, Euryalus, Cleopatra and Hermione completed with all five turrets. Bridge. Most Dido’s had these galleries. Apparently these galleries could be closed by shutters. Ensign Two has pictures of Dido taken in 1940 and 1947 clearly showing open galleries and a picture of her taken in 1945 with the area closed off with a series of vertical lines or panels at the appropriate location. However, three of the cruisers, Argonaut, Sirius and Cleopatra, apparently never had the open galleries. I have not found any picture of any of those three showing the galleries or any indication of panels that would show the presence of shutters. To the contrary, all pictures and artwork that I have seen, seems to unmistakably indicate that the bridgework on those three ships was completely enclosed. The kit comes with open galleries as can be seen in the enclosed photographs. I personally like this feature and wanted to model a ship with the galleries. None of the documentation in the above listed references mentions this apparent distinction in the design among the ships of the class. Since I wanted five turrets and open galleries, that limited my selection to Naiad, Euryalus and Hermione. I loved the Naiad 1940 camo scheme, Euryalus has a wonderful First Admiralty disruptive scheme, however, there does not appear to be any photographic evidence of the pattern on the port side. With the First Admiralty disruptive pattern the patterns on the starboard side would normally be different from the port side. Ensign Two was not clear on the paint scheme for the Hermione. The author suspected that she might be painted in Mountbatten Pink. Hopefully, the upcoming WR press release of Royal Navy camouflage 1939-1941 will provide the answer to this and other vexing questions. HURRY UP WITH THE PUBLICATION ! I WANT IT AND I WANT IT YESTERDAY ! Very few changes had to be made to convert the kit to the 1940 HMS Naiad. 20mm mount were not mounted on the class until the end of 1941. The kit comes with gun tubs molded into both sides of the after superstructure and at the stern for the 20mm guns. It was a simple matter to remove the gun tubs and sand smooth. In 1940 the class carried quad Vickers MG mounts on each side and at the rear of the forward superstructure. The Sirius kit did not come with these quad mounts. 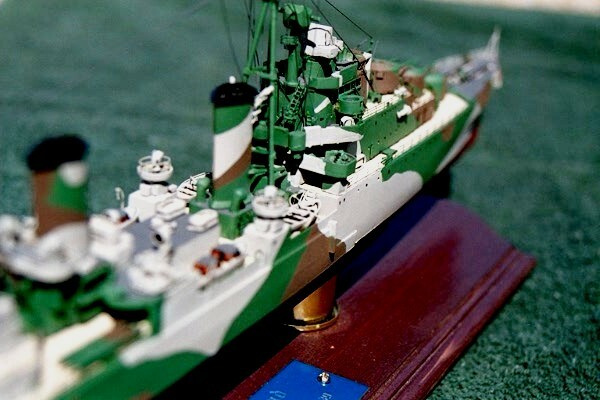 I had just finished the IS kit of the Tribal class DD in 1:350, which I completed as HMS Eskimo in 1942 in the Western Approaches scheme (another truly beautiful British camo scheme). As a result of building the Eskimo in her 1942 appearance, I had two spare quad Vickers MG mounts that had not been used (as with the Dido’s, they had been replaced by 20mm mounts by 1942). The Tribal kit came with both quad Vickers and 20mm so you had the option to build early war or mid war configurations. I scratch built ammunition canisters for these mounts and used them for the Naiad. The major changes from the kit and the 1940 Naiad is not the additions but the subtractions. The kit comes with brass Yagi radar, which was carried in 1942 but not in 1940. There are two circular platforms on either side and to the front of the rear stack of Sirius in 1942 that contained Yagi. Those parts are not used for the 1940 Naiad. 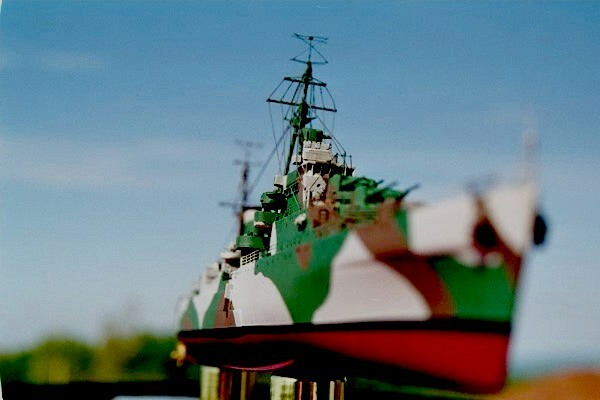 A minor amount of scratch building was used with the masts. The sides of the platforms where the three legs of the fore and main tripods came together and the horizontal support bracing were cut from excess brass on the fret frame and glued in the appropriate locations. Mast details varied from ship to ship and depending upon the year of service and are best modeled through the study and application of the photographic of the ship being modeled. On the rear of each 5.25” turret I added access doors and what appears to be shell ejection ports. I used doors from the RN door fret from Gold Medal Models and scratch built the ejection ports with resin scrap. Additionally I used reels from the brand new GMM brass reel fret to add these items to Naiad. I consider this fret as indispensable in the construction of my future projects. I also added extra Carley floats and scratch built the platforms and steam sirens on the fore stack. Additionally some framework on the pom-pom mounts was scratch built. The pom-pom railing comes on the included fret. The kit comes with two brass frets. One with more than enough railing and ladders for all needs of the model, with plenty left over. The second fret is for the Dido class specific items. No portion of either fret posed any problem to install. Overall, this kit was so straightforward and easy to assemble that it practically built itself. The other members of the Dido class can easily be modeled with this kit. The open galleries of the kit can easily be closed with a resin or plastic panel and sanded smooth to model Sirius, Argonaut or Cleopatra. 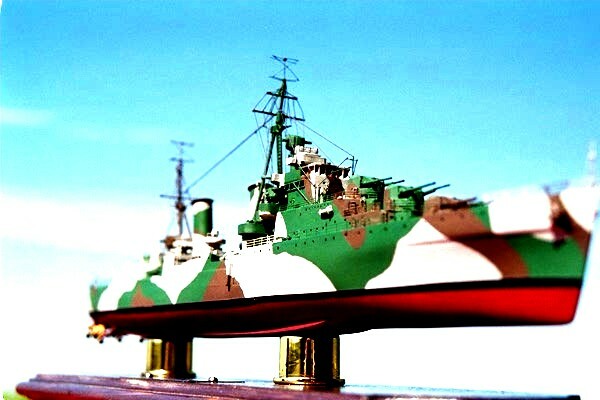 If you wish to model an early version of the class, I’m sure that Ted Paris (web site www.commanderseries.com and E-Mail dparis@ eznet.net) will provide the quad Vickers mounts needed for the early ships. The customer service of IS is the best in the hobby. If you wish to model one of the ships while they carried the 4” starshell gun, it apparently was the standard 4” gun on a Mk 19 mount. This seems to be the same gun that appeared on the Flowers Class corvettes and since IS models that class as well, I feel confident as well that they would provide that part (4” gun and mount) to you, if you needed it. You would have to scratch build the splinter shield around the mount. If you choose to model one of the class late in the war, you have to be more careful. As the war progressed, more and more light AA guns were added. Cleopatra, Euryalus and Argonaut all had Q turret removed in 1943 or 1944 in order to augment their light AA fit. The locations and quantity of the 20mm mounts varied from ship to ship. Ensign 2 has an outstanding section that covers the changes and locations in the AA fit for each ship in the class. Bottom Line. This is a wonderful kit of a workhorse of the Royal Navy and highly recommended. 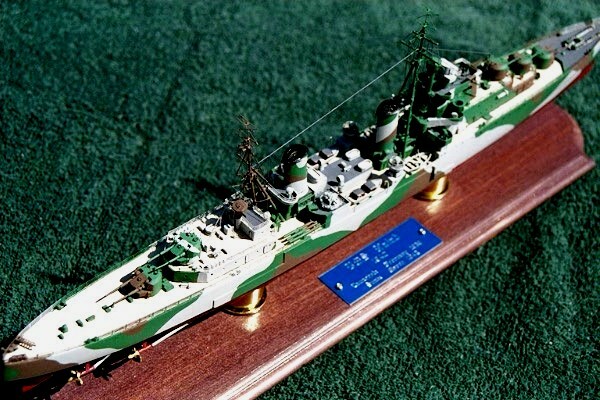 If you want to try a 1:350 cruiser or larger, this is a great one to build.